We at Trusted Shops collect data safely and securely. We are registered with the Information Commissioner’s Office (ICO) and our registration number is Z2211983. You can visit our website without providing any personal information. With every visit of the website, the web server automatically saves a so-called server log file which, for example, contains the name of the requested file, your IP address, date and time of the call, the amount of data transmitted and the requesting provider (access data) and documents the call. For the purpose of a shorter loading time we also use a Content Delivery Network ("CDN") for delivering our web assets via web servers of that CDN provider, who is working for us by means of an order processing agreement. Access data is also collected accordingly on the provider's web servers. When you visit our websites in social media, your data may be automatically collected and stored for market research and advertising purposes. So-called usage profiles are created from these data using pseudonyms. These can be used, for example, to place advertisements inside and outside the platforms that presumably correspond to your interests. For this purpose, cookies are usually used on your terminal. The visitor behaviour and the interests of the users are stored in these cookies. This serves in accordance with Art. 6 para. 1 lit. f. GDPR to protect our legitimate interests, which outweigh our interests, in an optimised presentation of our offer and effective communication with customers and interested parties. If you are asked by the respective Social-Media platform operators for a consent (agreement) into the data processing, e.g. with the help of a checkbox, is the legal basis of the data processing art. 6 exp. 1 lit. a GDPR. Online dispute resolution according to Art. 14 (1) Regulation on consumer ODR: The European Commission provides a platform for online dispute resolutions (ODR) which can be accessed under http://ec.europa.eu/consumers/odr/. Consumers have the possibility to use this platform for resolving their disputes. We are ready to participate in extra-judicial dispute settlement proceedings before a consumer dispute resolution body. Doing business in Germany? 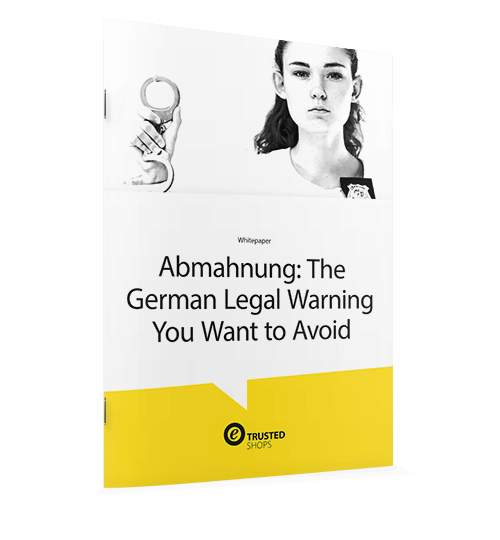 Are you aware of “Abmahnungen”, the German legal warnings? Though the German market is filled with potential, there is the matter of the Abmahnung to be aware of. If you break any competition laws, your competitors can sue you! This can be not only a headache, but it can also be very costly to your business! Read more about Abmahnungen and what you can do to avoid them in our free whitepaper.